Hereby the transfer discussion for ICL19 is opened. You may want to offer your riders or needs in here, especially when the Transfer Season starts talks on potential deals an offers could take place here. Transfer Updates will also be posted in this thread. Sep Vanmarcke stays, Rigoberto Uran goes: In this scenario we are searching for both money and riders that could strengthen our cobbles squad. It's time to support Vanmarcke properly so that he can finally show why he is the best Cobbler in the ICL. We would sell a couple of assets to make him work properly then, with Uran as the holy grail with his palmares and awesome wage. Sep Vanmarcke leaves, we receive mostly rider compensation: If we receive a decent leader, we are searching for a guy that does both sprinting and cobbling pretty well, looking for the likes of Degenkolb, Kristoff, Sagan, Phinney. Otherwise it would need another WT leader or World Class talent to make such deal possible. Sep Vanmarcke leaves, we receive mostly money compensation: We may scrap the idea of scoring big time on cobbles. We'll search for a minor scoring cobbler instead and focus on strengthening our already given strengths like Stage Races and Hills. In this scenario also Rigoberto Uran would likely stay if not very early sold for a convincing offer. Apart from that we need to make a little bit of cash, hence we are trying to turn our silverware into money. Hence you'll have the chance of signing awesome young guns like Lei (DT star alert! ), Dimas and Ollero as well as development wonderkid Alves, who outscored Boileau 2 times in development points in a row. With Groenenwegen and Sarmiento also 2 classy CT leaders on great wages are on offer. Keersmaekers Kim I wish if I'd kept it in my pants for crappy talents? FL MO HIL TT PRL COB SP ACC DH FTR STA RES REC Age Pot. So basically every rider is available for the right prize! Come and PM with any sorts of ideas. Cash offers preferred but including riders can work too. Van Avermaet may be sold, but it'll need a very good offer. Intxausti and Vanbilsen will be sold for a decent offer. Either of Parra or Frank will be sold. If replacements are brought in, they can both go. Either of Brambilla or Meijers will be sold. If replacements are brought in, they can both go. Will readily listen to offers for Vermote and Windischbauer. The youngsters will need good offers to be sold. This is negotiable to some extent depending on transfer situation. Degenkolb, Bauhaus, Svendsen and Honigh are not for sale. Suntory are looking to train some of their talents so some quality riders are available for a reasonable offer. The remaining riders that are not listed here are from the Telenor Rider Search programme and are not for sale under any circumstances. An important time of year as everyone scrambles around to make sure their squad is the best it possibly can be! We're no different, although obviously limited by our very strict focus. This focus on Caribbean cycling means we have no real intentions to sell riders, not that we expect anyone really wants our ridershaving release Lobato and Henao our two stars. That said, if we were to recieve an offer for Anders Newbury or Xavier Ela we would seriously consider it! Full stats for both riders can be found below. Ideally we'd like a rider swap, exchanging Newbury for a similar level rider from one of our focus. With Ela we'd offer him and some cash money for a rider from one of our focus nations. As for our plans, we've got one rider marked up in the Free Agency we're gunning for 110%. So it will be a very quiet and simple window for Cool Runnings Warm Cycling, saving plenty of money for Research, Training and Scouting. Liberty Seguros is offering currently putting following riders in the shopping window for sale. Quick update to people who sent me PMs (and anyone else wondering), I'm not going to sell Daniel Oss. I'm interested in making a swap of scouted riders, I'll probably send out messages to those involved tomorrow. Our trio of Spanish riders in the team could leave the team with the right offer. Angel Madrazo, Omar Fraile and Manuel Sola are all in their minimum wages, so maybe that can attract better offers? 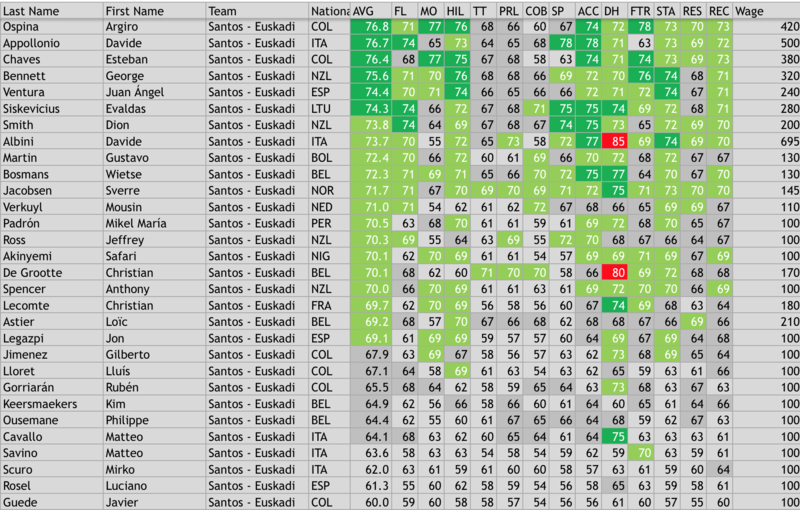 Big news out of Santos-Euskadi this afternoon as the transfer availability of many valuable riders was upgraded! Although they'd all require good deals, the following riders could leave the team in some circumstances! Fellow managers were told to Privately Message the Santos manager or to hit him up on Skype. From Allianz team any rider is up for sale, so feel free to PM me. AND, two of our 100 wage riders can leave for the minimum fee. All riders except Durbridge and my pot6 riders are available for sale. I don't need to sell all, but a bit of extra cash wouldn't hurt. Surprisingly I'm mainly looking into cash offers. I'll not do long post about it. CCC - all riders are available except Ulissi/Komisarek duo. I can think about Ulissi/Komisarek ONLY if offer is really, really (I mean really) good. I'll just post it here: I intend to fully stay out of transfers, no riders available, nor do I want to buy any from your teams. EDIT: Not very prone into making transfers, but PM me in case you have any deal in mind.